Flood waters could remain in fields here a little longer – Welcome to Wyandotte Daily! K-5 at Hutton Road was closed to through traffic because of flooding on Monday evening. Wolcott Drive is about a block north of this road closure sign, and that street, which is also K-5, is closed to 107th. The former Thunderlake Speedway, 5501 Wolcott Drive, a former go-kart track to the left, has flooded. The go-kart track has been closed for some years. Lakeside Speedway at 5615 Wolcott Drive flooded on Saturday, along with some other businesses on Wolcott Drive. 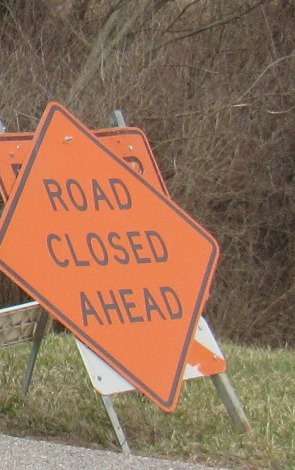 A road closed sign at 93rd Street, east of I-435. 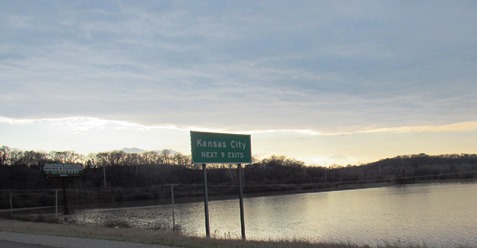 Flood waters from the Missouri River could remain in Wyandotte County fields a little longer, as water releases have been stepped up from reservoirs upstream and rain is in the forecast for Kansas City and the river basin area. With melted snow upstream entering the Missouri River basin area, the reservoirs upstream will be releasing more water into the river, according to Corps of Engineers officials. The Corps of Engineers is stepping up water releases from the Gavins Point dam in South Dakota to 27,000 cubic feet per second today, and 30,000 cubic feet per second on Tuesday, Wednesday and Thursday, according to officials at a news conference today. This plan was changed from Sunday’s announcement. There is currently major flooding on the James River upstream in the Dakotas, and water from the James and the Big Sioux rivers have an effect on the Missouri River. A strong storm system is currently in the weather forecast from Thursday through Sunday, according to a National Weather Service forecaster. About 1.5 inches of rain is expected to fall across northeast Kansas and northern Missouri, as well as some additional rainfall to the north. 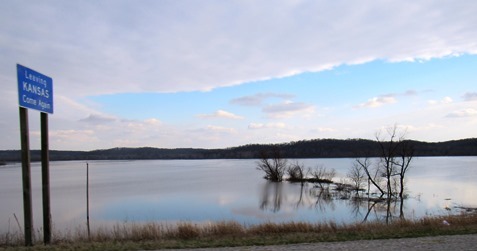 If the rain falls as expected, some cities could receive 1.5 to 3 feet rises in the river, and the Missouri River at St. Joseph, Missouri, could rise 5 feet on Monday, according to the forecaster. Thursday’s projected rain amounts will not show up in the National Weather Service river level forecasts until Tuesday, according to the National Weather Service forecaster, as there are only two days of anticipated precipitation included in each river level forecast. By Friday evening, the entire storm should be included in the river level forecasts, he said. By the weekend, Corps officials and forecasters believe that the rivers will be substantially lower than they crested this past weekend. When the rivers rise next Monday, the main effect is that water will be on the levees for a longer time, according to Corps officials. With the longer time, the levees could become more susceptible to issues such as seepage or sand boils, according to officials. To check on roads affected by flooding, visit KanDrive.org at http://www.kandrive.org/kandrive/roads/#construction/K-5/-96.0040/38.7201/7. The former Thunderlake Speedway at Hutton Road and K-5 has flooded. The former go-kart track has not been open for several years. 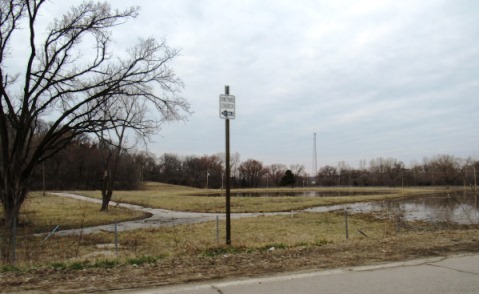 Another view of the former Thunderlake Speedway at Hutton Road and K-5. Another road that was closed was 93rd Street near Wolcott Road. 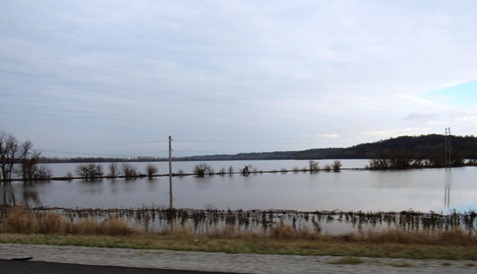 Fields to the east of I-435 in Wyandotte County were flooded on Monday evening. The flooding occurred on Saturday. 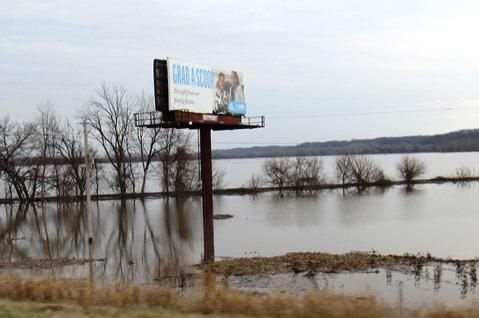 More flooded fields along I-435 in Wyandotte County were seen on Monday evening. Flood waters covered fields next to I-435 in Wyandotte County on Monday evening. Flooded fields next to I-435 in Wyandotte County on Monday evening. The Missouri River, looking east, on Monday evening. 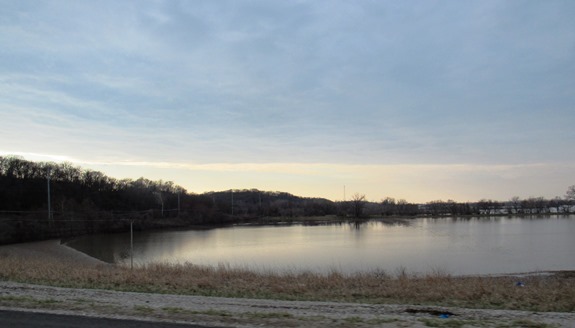 Flooded fields to the west of I-435 in Wyandotte County on Monday evening.